The idea of vacation changed the day my son was born. Sure, we continued to jet set while he was a more portable baby, but as he got older we realized our days of adult-oriented vacations were over for a while. We’ve loved the Club Med-style, all-inclusive vacation with a kids’ club. But coming off a week in Greece where we only saw our son for breakfast and dinner, I thought we could all benefit from spending time together… but I still wanted to rest and recharge. Is that even a thing?! Yes, dear readers, it is. I don’t know how I discovered Pagel, but remember telling my husband, “Look! This place is designed for kids. They play and we can relax. It’s like summer camp. With wine.” We emailed the owner and were booked 12 hours later. Done and done. A good vacation is where kids can be kids and parents can be adults. What is this magical place? Pagel is a village of gîtes (holiday cottages) in the Southwest of France, owned and run by a British family. Their motto is, “When the children are happy, the parents are happy.” I couldn’t agree more. A good vacation is where kids can be kids and parents can be adults. The Pagel experience is designed to be kid-centric. All the cottages are child-proofed and contain lots of books and toys based on your child’s age and interests. (My son still asks for the racetrack he played with there.) There are 3 acres of fenced land where kids can run wild if they get bored with the pool, the giant pirate ship, an indoor playbarn and multiple jungle gyms. There’s even a half-day kids’ club several times a week with structured activities like face-painting, making pirate hats or playing Red Rover. What do parents do while all this is going on? Chill. Each gîte has a front porch where you can watch your kid (or not) from afar. During our holiday, all the parents quickly befriended each other and hung out in the outdoor seating area long after the littles were in bed. We learned whose kid belonged to whom and made an effort to keep a collective eye on things. One Londoner told me that during the week he was able to read 600 pages of an intense, esoteric book about meditation. That’s a proper holiday. If you get stir-crazy sitting around all day, there are loads of fun spots nearby. 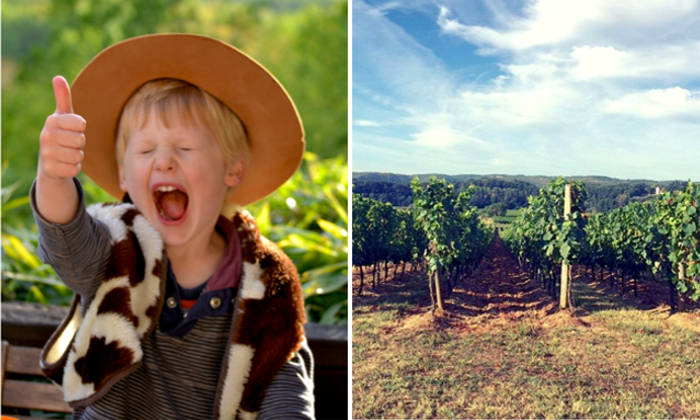 We loved the Vallee des Singes (monkey park) and wine-tasting at local vineyards. The welcome book in each cottage provides a boatload of information about everything you can do, including driving time and how long you should budget for each activity. They’ll tell you which local producers have the best foie gras, if tht’s your thing. If you’re an Anglophone living in France, this could very well be the perfect spot. Pagel runs three locations in the same general area. 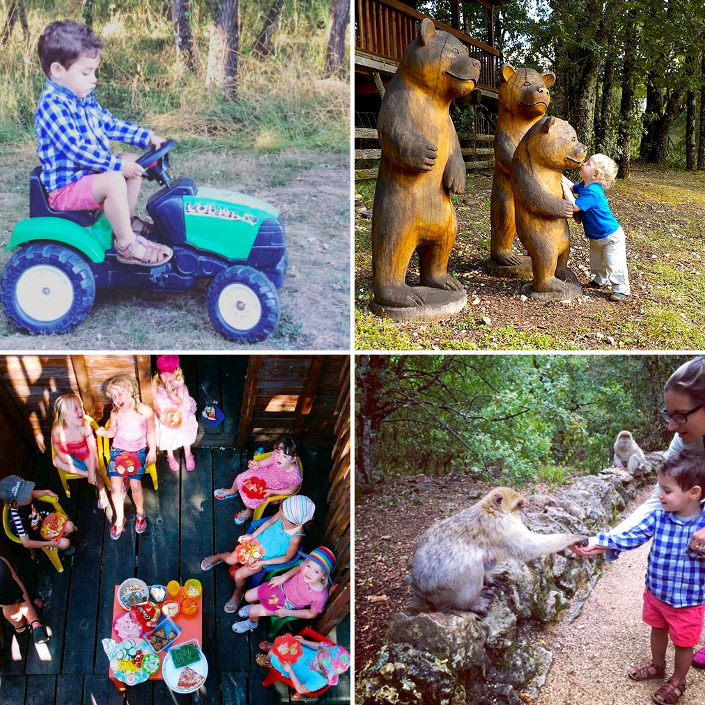 We stayed at the main property (Pagel), which has nine gîtes and two glamping “safari lodges.” Each of the gîtes are 2-3 bedrooms and, as mentioned, set up for kids. They’ll provide pretty much anything you can think of: crib, toddler bed, bottle warmers, blackout shades, training potty—even an arrival gift for your kid. Our gîte is called Lower Wildwoods. We loved it because our front porch opened up to the playbarn, where my son went every morning just after waking up. (Extra time in bed for me!) The cottages aren’t fancy, but they were recently renovated and very clean. I got the sense that the ground-floor cottages are the coolest in the summer, so keep that in mind. Again: If you’re interested, don’t wait until the last minute. And maybe we’ll see you there! Next Article #LaVie: The Lice Have Landed!